that when I read first time your explanations about meanings of Nephesh and Gehinnom, I really was shocked. In fact, we have already known them but the ministeries where in North America don't have these informations. Wow! Actually, I really don't understand that how we can reject the first churches which had fathers who appointed, trained by the apostles? The Bible alone? Synod of Hippo? The Third Council of Carthage? I really wanted to join to your ministry because of learning new things about Christianity but I think Sola Scriptura is not wisely for me and all of the people who live in Asia Minor. I suppouse, that idea is a big problem since Luther, Calvin's time. Could you explain that how Sola scriptura could be reasonable? Where were the fathers who appointed, trained by the apostles when Yahweh's community was going to wrong ways? We see that from you, the Holy Spirit didn't work past times so how we can be sure that it will work in your ministry? I hope I could explain it enough. Thanks for answers till now. First let me say that I love your ministry, and I watch no one else because of the quality of the messages and truths that you teach. I have listening and reading your postings on U-tube and have become interested in your Ministry. Please add me to your mailing list. Do you take subscription requests? I would like to receive your magazine " Restoration Times? Do you have houses of worship in New York by Westchester Area? Thank you for your kind and immediate attention and response. I am struggling to understand the requirements of the Passover. Whether it is valid since the requirements to partake of it is no longer valid? I would like to send our greetings to Robert Wirl. I understand he is part of your ministry. Thank you. Be blessed. I have a question. is it good for a true believer who keeps the Torah and the commandments of our savior Yahshua ha'Mashiah to wear the gold jewelry? Because in "KEPHA" ch 3 vs 3. "Your word should not be outward - arranging the hair, wearing gold".... Also in "YESHAYAHU" ch 3 vs 18. "In that day YAHWEH takes away the finery of the anklets, and the headbands, and the crescents, the pendants, the bracelets and the viels, the headdresses, and the leg ornaments, and the sashes, and the perfume flasks, and the amulets, the rings, and the nose jewels". Also in "SHEMOTH" ch 33 vs 5... "And now, take off your ornaments, and i shall know what to do to you". vs 6... "So the children of Yisra'el took off their ornaments at Mount Horeb. I will appreciate it if you respond to my question. Shalom! In 1 Peter 3:3 We believe we are to witness to others by our inward self that Yahweh is shaping, Not by our apparel or outward appearance. The Pharisees did something similar this with their long Tzit tzits and phylacteries. In Isaiah 3:18 you can see he has a reason for taking away their "Tinkling ornaments". In Verse 8 Yahweh says "For Jerusalem is ruined and Judah is fallen, because their tongue and their doings are against Yahweh, to provoke the eyes of his glory" You can continue to read and see it isn't the jewelry that is inherently bad here, Yahweh is only removing it to humble them. The same thing could be said about the verse in Exodus as well. Yahweh makes it clear that he LIKES jewelry and adornment, but that it should not become a vanity and pride issue. Ezekiel 16:8-14 shows us how Yahweh (Metaphorically) adorned Israel. There are many more examples throughout Scripture (especially in the Song of Solomon). A few weeks ago I received my Aramaic English New Testament (www.aent.org). In question is Matthew 27:46 in which the KJV states Y'shua says ,"My God. My God. Why Have You Forsaken Me?" The Aramaic states, "My El! My El! [Lemana shabakthani] Why have you spared me?". Compare to Deut 31:6; Hebrews 13:5; this is a major conflict in which YHWH says he will not forsake and then He forsakes his son. I heard Aramaic scholars agree with the Aramaic back in the '70's. What do you think? We have spent several Feasts; Spring and Fall, with the loving brethren at YRM and love them dearly. This organization is doing a great evangel-outreach to the world! Please consider becoming an "Outreach Partner" (Look under "Support" above) to help spread the Truth about the returning of the Messiah! HalleluYah! I received my Restoration Study Bible about 3 weeks ago. What a blessing! The perfect study tool. Thanks so much for this bible!! I have been conflicted for almost 2 years, reading scripture that doesn't seem to fit with the doctrines of the church. I've mentioned things to pastors but they "don't argue, they believe what they believe". And why, if we know God's name is Yahweh and Jesus' name is Yahshua do we not call them by their Righteous Names? Yahshua is the name above all names not Jesus! Anyway every time I pray for the truth I find an Hebraic roots website. First it was 119, then Passion for Truth, and just last week it was yours. I really love your site, I have been reading your articles and watching your videos and just saying "YES, YES". So I just ordered your Restoration Study Bible, though I'm not a fan of the KJV, and 2 of your mini course. 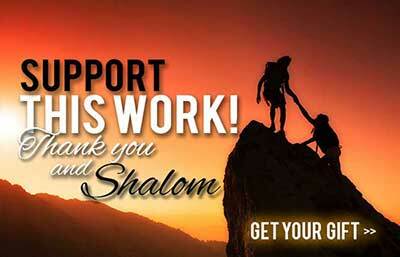 Thanks so much for your website and all you do to bring Yahweh's truth to the world. Also could you pray that Yahweh will open my wife's eyes to His truth as well. Thanks. Hello, What is your history from when you started this Ministry? Yahweh's Restoration Ministry started in 1999. However, together Elders Alan Mansager and Randy Folliard have over 60 years of experience in the faith. Historically, out roots go back to the Church of God (Seventh Day). Shalom. I have been following YRM since two years & spiritually getting edified. 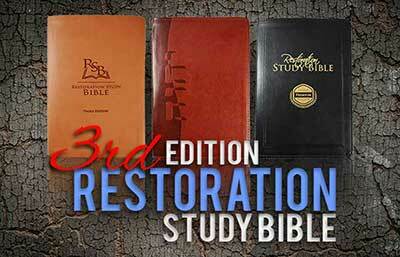 Purchased three Restoration Study Bibles. Tried to contact YRM already twice, but no response yet. Appreciate your response. Thank you very much. Hallelu YAH. Since 2007, when I was still unmarried and in college, I am starting to study the word of our heavenly Father. As of now, I am active on sharing and sowing the seeds of deliverance, particularly the goods news of the Kingdom of Elohim. I hope that Yahweh's Restoration Ministry will come here in the Philippines. Shalom and Baruch HaShem! Since 1999 our Abba Father took my old life through heart bypass surgery and began a new one leading me on a journey of ever increasing truth and light. I am thankful for the stops along the way with the most recent being The Living Church of G-D. After 6 years there I realized one day after studying Yahweh's Restoration Ministry that there were yet 2 things to acknowledge: Restoring the Names Yahweh and Yashua and Keeping The Feasts on the right days. Upon this discovery it was my joy and great privelege to travel from NC to Holt's Summit, MO to meet all the wonderful brethren there and to be baptized by Randy and Alan in Yashua's Name. What a wonderful assembly of some of the finest men, women and children you could ever hope to meet. I would love to be able to bottle them up and bring them home with me...Oh, wait...that's right...I can! I can worship with them every Sabbath online! Halleluyah! What a blessing! And Yah willing I will be with them in person on the Feast Days. Shabbat Shalom everyone! I have been blessed by yrm. I really do like the Bible translation I received from you. Thank you. I study with you alot.